Ottawa Senators players who were caught on tape joking about and criticizing their team's defence in a video posted online are apologizing for their comments. The Senators released a statement Monday night from Thomas Chabot, Dylan DeMelo, Matt Duchene, Alex Formenton, Chris Tierney, Chris Wideman and Colin White, who were shown talking about Ottawa's ineffective penalty kill and mocking one of their coaches in a recording that apparently came from a camera mounted on the dash of an Uber driver's van or SUV. The players mocked assistant coach Martin Raymond, who handles the team's penalty-killing unit, in the five-minute clip that was recorded in Phoenix during Ottawa's west-coast road trip at the end of October. Duchene later adds that he “(hasn't) paid attention in three weeks” in Raymond's meetings. “Here's the other thing, too. We don't change anything ever. So why do we even have a meeting?” he says in the clip. The video recording is the latest scandal for a team that's been riddled with them lately. 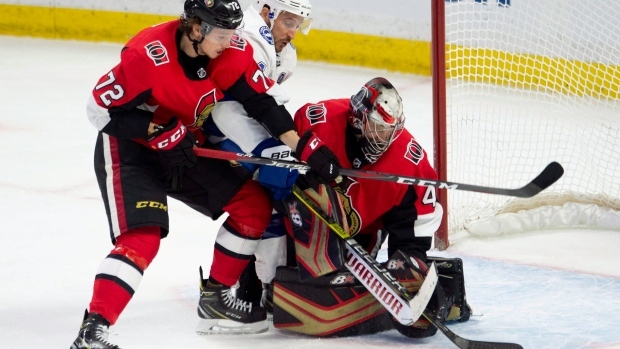 Negative headlines dogged the Senators last season, including a threat by owner Eugene Melnyk to move the team if ticket sales didn't improve. And in May, the wife of former captain Erik Karlsson filed an order of protection against Mike Hoffman's fiancee, claiming she had posted over 1,000 “negative and derogatory” comments about her on social media. Both Karlsson and Hoffman were traded in the off-season.